Deeply influenced by Enlightenment writers from Naples and France, Vincenzo Cuoco (1770–1823) was forced into exile for his involvement in the failed Neapolitan revolution of 1799. Living in Milan, he wrote what became one of the nineteenth century’s most important treatises on political revolution. 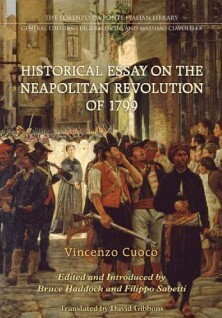 In his Historical Essay on the Neapolitan Revolution of 1799, Cuoco synthesized the work of Machiavelli, Vico, and Enlightenment philosophers to offer an explanation for why and how revolutions succeed or fail. A major influence on political thought during the unification of Italy, the Historical Essay was also an inspiration to twentieth-century thinkers such as Benedetto Croce and Antonio Gramsci. This critical edition, featuring an authoritative translation, introduction, and annotations, finally makes Cuoco’s work fully accessible to an English-speaking audience.